BACKGROUND: Sacroiliac joint (SIJ) pain is an under-recognized condition. 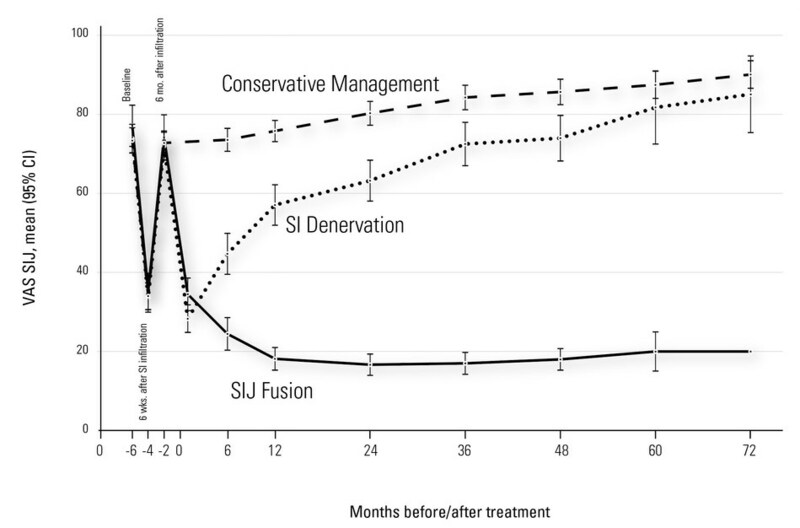 Substantial information supports the safety and effectiveness of SIJ fusion (SIJF). Long-term follow-up after SIJF has not been reported. OBJECTIVE: To determine responses to conservative management (CM), SIJ denervation, and SIJF in patients with SIJ pain unresponsive to CM. METHODS: Retrospective study with long-term (up to 6 yr) follow-up of 137 patients with SIJ pain seen in an outpatient neurosurgery clinic who received either CM (n = 63), sacroiliac denervation (n = 47), or minimally invasive SIJF (n = 27). At each routine clinic visit, patients completed pain scores and Oswestry Disability Index. Additional data were extracted from medical charts. RESULTS: Patients treated with continued CM had no long-term improvement in pain (mean worsening of 1 point) or disability (mean Oswestry Disability Index worsened by 4-6 points), increased their use of opioids, and had poor long-term work status. SIJF patients had large improvements in SIJ pain (mean 6 points), large improvements in disability (mean 25 points), a decrease in opioid use, and good final work status. Sacroiliac denervation patients had intermediate responses (0-1 and 1-2 points, respectively). CONCLUSION: In patients with SIJ pain unresponsive to CM, SIJF resulted in excellent longterm clinical responses, with low opioid use and better work status compared to other treatments.